Google Pixel 2 is finally releasing in October. The original Pixels was also launched exactly one year earlier in October 2016. Osterloh claims “pixel stays premium” confirming the phone will remain in the high price segment. This may be disheartening to some who were in hope for a budget Pixel. The Google Pixel 2 is expected to bring some enhanced features to Google’s own-brand smartphone and could feature a bigger edge-to-edge display with a better camera, and improved design. A fingerprint scanner and missing 3.5mm headphone jack are expected. Pixel 2 will have interactive sides which will allow users to perform tasks by simply squeezing the phone. The new smartphone will also come pre-loaded with Android Oreo. 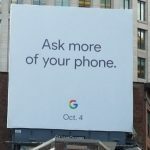 Evan Blass, an American blogger who gives mobile leaks tweeted about Google Pixel 2 stating “Google’s second-generation Pixel handsets, powered by Snapdragon 836 SoC’s, will be unveiled on October 5th,” he said on Twitter. Considering Blass’s tweet we expect that Google is going follow the same schedule as they did for the previous Pixel phone. Google is said to be tapping HTC for its BoomSound tech (as is made apparent by the dual-speaker ports seen in the leaked image) and the squeeze-friendly technology found in the HTC U11. Both features will give the Pixel 2 an edge over the iPhone 8. Google is yet to announce anything about the new Pixel phones. On another news, Google is reported to launch its own headphones which might be along with the Google Pixel 2. Maham is a Computer Science graduate from COMSATS Islamabad and is currently working as a content lead at Centangle Interactive. She is an avid photographer.